ETU-LINK EQ854X-3MCD01 are designed for use in 40 Gigabit per second links over multimode fiber. They are compliant with the QSFP+ MSAand IEEE 802.3ba 40GBASE-SR4. EQ314X-3MCD2 is a Four-Channel, Pluggable, Parallel, Fiber-Optic QSFP+ Transceiver for InfiniBand QDR/DDR/SDR, 10G/8G/4G/2G fiber channel, PCIe and SAS Applications. 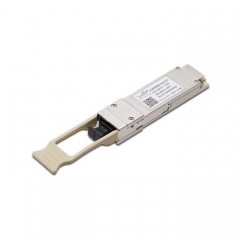 This product is a transceiver module designed for 40km optical communication applications. The design is compliant to 40GBASE-ER4 of the IEEE P802.3ba standard. The module converts 4 inputs channels (4ch) of 10Gb/s electrical data to 4 CWDM optical signals, and multiplexes them into a single channel for 40Gb/s optical transmission. Reversely, on the receiver side, the module optically de-multiplexes a 40Gb/s input into 4 CWDM channels signals, and converts them to 4 channel output electrical data. The transceiver internally multiplexes an XLPPI 4x10G interface into two 20Gb/s electrical channels, transmitting and receiving each optically over one simplex LC fiber using bidirectional optics.